Despite the low budget and restricted filming (mostly around Harefield Grove), this was a raw, gritty, uncompromising and relentlessly exciting way to introduce the characters. Old Dog With New Tricks was a sharp opening episode which established what CI5 were all about and George Cowley's speech about what they stand for is a real gem. The only flawed part is him pretending to be the Home Secretary when he goes to the hijacked police station. Long Shot was a fun episode featuring an endearingly camp villain, Where The Jungle Ends was a simple revenge actioner with some fiery shootouts and Killer With A Long Arm IMHO was the first true Professionals episode because it had calculating foreign bad guys, classic Bodie and Doyle banter and some suspenseful action sequences directed ably by David Wickes. Overall, the episodes were very enjoyable such as Heroes, Private Madness Public Danger, The Female Factor, Everest Was Also Conquered, the thrilling Close Quarters (which could have had a more menacing actor to play Meyer) and When The Heat Cools Off which was a murder mystery episode with not much action, but good performances all round from Shaw, Collins and Jackson as well as Laila Ward as the manipulative Miss Haydon. Klansmen was a fairly weak, contrived episode despite its intentions and it's a shame ITV never showed this. I feel they could have done at a very late night slot back in the '80s, especially in the wake of 24 hour TV. Look After Annie was average at best and Stakeout is an okay one, livened up by Bodie & Doyle banter, a fight scene and a tense finale. Worth pointing out also that drugs were featured quite heavily in this series, something which hadn't really been done before, especially on The Sweeney which was mostly about cops and robbers. We saw several characters who were drug addicts (Tincan in Heroes, Susan Fenton in Private Madness Public Danger, Ann's daughter in The Female Factor and Pamela Stephenson's character in Stakeout). There was also the sleazy drug dealer in PMPD and his interrogation scene with Cowley and Doyle is one of the most disturbing, chilling moments in the whole series. Great post dsc. Like in Minder the first series is very much an experimental feel in parts but the acting as always is top notch. The cars in this series are also slightly different and some of the storylines a little whacky in parts but I generally like and regularly return to series 1, especially as I have the BluRay sets! There is a definite vibe to The Professionals right from the start: action, a bit of violence, two top leads and a fantastic score from Laurie Johnson. The music is consistently superb throughout the series and really 'sets the scene' in the series - to a certain extent it is there in 'The New Avengers' too but seems to suit the style and type of series that The Professionals is far more in my opinion. I thought Minder got more interesting towards the end of the 1st series because the writers were seeing something special in the relationship between Terry and Arthur which would be put to humorous effect in series 2. 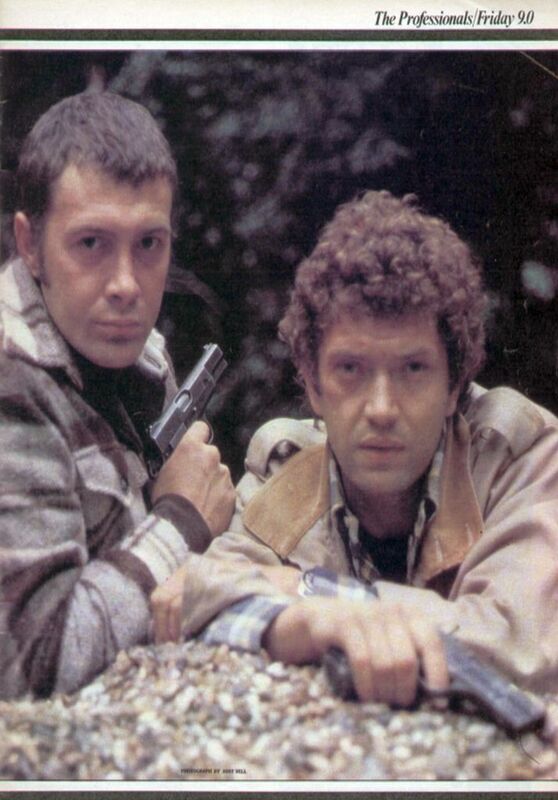 In the 1st series of The Professionals, there were quite a few comic-book style stories in which Bodie and Doyle had to save London from being destroyed (Private Madness Public Danger, Stakeout) and Killer With A Long Arm had an outrageous premise as well (a high velocity rifle that could operate at unimaginable distances), yet nevertheless was still enjoyable. I also think the villains in this series were considerably more brutal and sadistic than they would be in later episodes. Laurie Johnson's music was just as important a part of the show as Brian Clemens' contributions. He knew how to add suspense and support an action scene to make it even more thrilling. 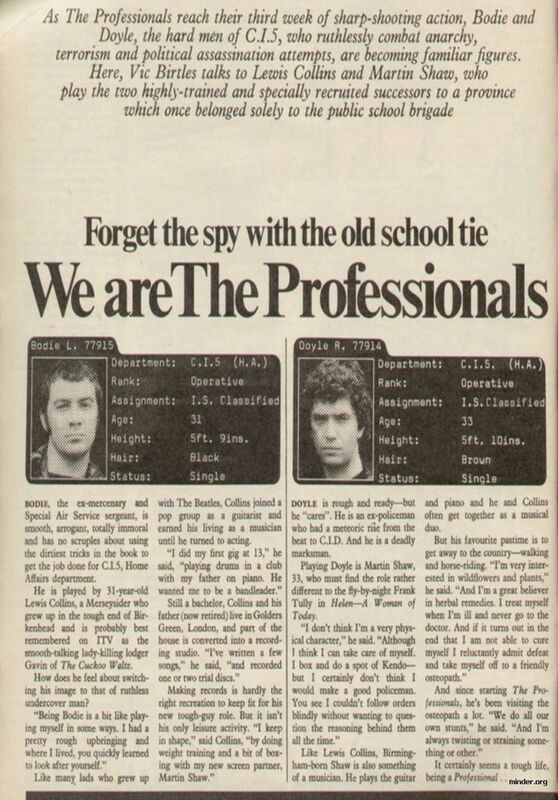 The Professionals was always intended to be more grittier and tougher than shows like The New Avengers. I think the greatest strength of the series as a whole is that not only did Brian Clemens create two lead characters who were opposites but that he had the good sense to cast actors in the parts who were opposites. I know Clemens frequently described the Doyle and Bodie characters as flint and stone, nitro and glycerine etc. and he also applied that to Shaw and Collins.. A simple yet most effective stroke of genius. I like the way its says "Status: Single". What has that got to do with them being in CI5? Edster, I haven't watched it all yet but I like what I've seen so far. Cheers, I've an HD version that's just processing at the moment. I originally wanted to use the Network Blu-Rays that I purchased but unfortunately I couldn't for the life of me figure out how to rip them onto my Mac. (I do have a Bootcamp drive for Windows though) I'll try a bit harder for the series 2 anniversary to get the Blu-ray episode footage in for that. down the same piece of wall , in Long Shot ? at the beginning , mainly due to good old British Leyland reliability . We only saw Doyles first car , a blue Triumph TR7 , a couple of times as it kept breaking down . However , saying that Bodie s Dolomite Sprint POK79R , is back on the road , after several years on SORN ! "Cor ! did you see where that hand grenade ended up !!!! " That was a brilliant video about series 1. Well done, Ed. Nicely put together and liked the ending too. Very funny. 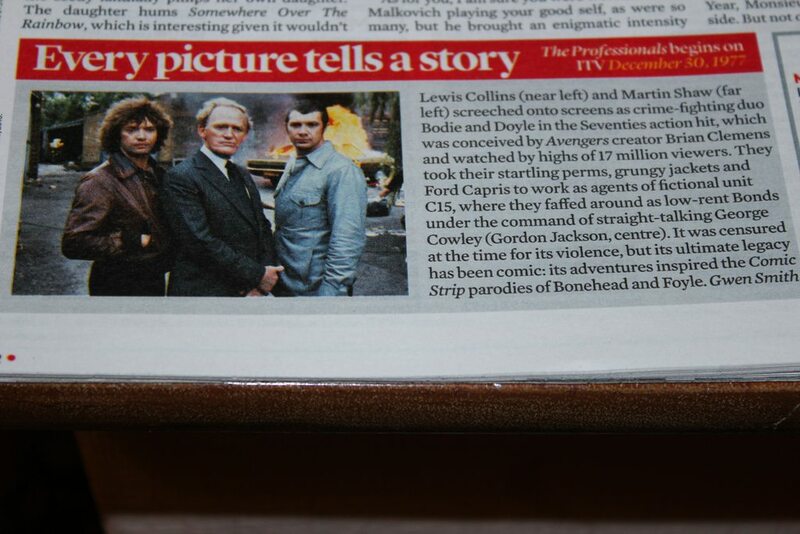 I watched the 1st ever episode to be shown back in 1977 today. Takes me back to 1999 when I bought a second hand video that featured Private Madness, Public Danger and Hunter/Hunted. IIRC the prints were very grainy and washed out but to watch Private Madness, Public Danger in digitally restored, clear, colourful form is really a sight to behold and makes you grateful towards Network. I reckon I'll be watching the rest of series 1 over the next few weeks according to how it was first screened in 1977/78.